Here at gamingchairs.com, I get asked to review a lot of chairs, it is a perk of running the site and something I look forward to. This time around I was asked to review the Alpha series M gaming chair in Red. It’s rather exciting business and I like to think of how this level gaming chair is going to be different from the others that I usually find myself in. This chair does possess that subtle familiarity that comes with most gaming chairs, but it does also have a few notable features that make it a unique piece of gaming furniture in itself. The Levl Alpha takes on a rather distinctive approach to adjustable lumbar support. Whereas most gaming chair manufacturers are content with simply using a pillow that isn’t attached to the chair; the Alpha comes with a pillow that sports a pair of adjustable hoist-straps. These straps allow for adjustable lumbar support that can be modified to take the user’s height into consideration. This is a very welcome addition to an already marvelous gaming chair. Let’s face it, that kind of confidence is pretty awesome to see. A lot of chair companies charge restocking fees, fees to send your chair back to them, 30 days only and basically make it hard to send your chair back if you do not like them. But Levl’s impressive list of helpful clauses displays a refreshingly attentive approach to customer support. This isn’t very often seen practice from gaming chair manufacturers, especially so at the budget-option level. This is an especially effective way for a growing manufacturer to gain trust and credence from their customers. I was curious to see if the Levl Alpha Gaming Chair substantiated the confidence this company had in it. The Levl gaming chair was boxed perfectly as you would expect and when I opened it, everything was in-tact and compact and looked easy to assemble. The parts were heavy and the steel frame was robust. The quality of the components was evident immediately as I took everything out and there were no surprises at all. My wife sighed as another chair arrived and asked who we would give this one too but that is another story (watch this space for giveaways)… I digress… I laid out all the components and was ready for assembly. If you have read any reviews on the site, I pride myself on a lack of DIY ability so when I give a time for putting together a chair, you can bet it is a real one. Yes, I have now had some experience with this so my times are improving but I am still bordering useless. I put the Levl Alpha Gaming Chair together in 25 minutes, I found it very easy to assemble and where I have had issues in the past lining up the bolts that link the mainframe, in this case, it was very easy. The chair frame was notably VERY sturdy and heavy, this does mean I would recommend building it where you want it to stay, it also explains why the chair has such a robust guarantee. I really couldn’t see myself breaking this chair at all. The Levl gaming chair is a bit heavy so the only awkward part was trying to hold the heavy back of the chair while trying to position it on the bolt. Since I have quite a bit of experience assembling gaming chairs, as I just mentioned, to me it wasn’t too bad. You may want to ask somebody to give you a hand or at least be an extra set of eyeballs to help you ease the body of the chair down on the bolt since you will have a hard time seeing it while holding it. Levl Alpha Gaming Chair is not trying to be the best-looking chair on the market. The chair looks every bit the same as DXracer and AKracing, in fact, it looks very similar to most good gaming chairs I try. This is ever so slightly disappointing for me but bear in mind I try a LOT of chairs. For the avid gamer, it will look just great. It has a lumbar neck rest which I personally like and a good lower back support. These made the chair look better when added and more high end. There is not much more to say on the look except there is a choice of white, blue and red in this model. 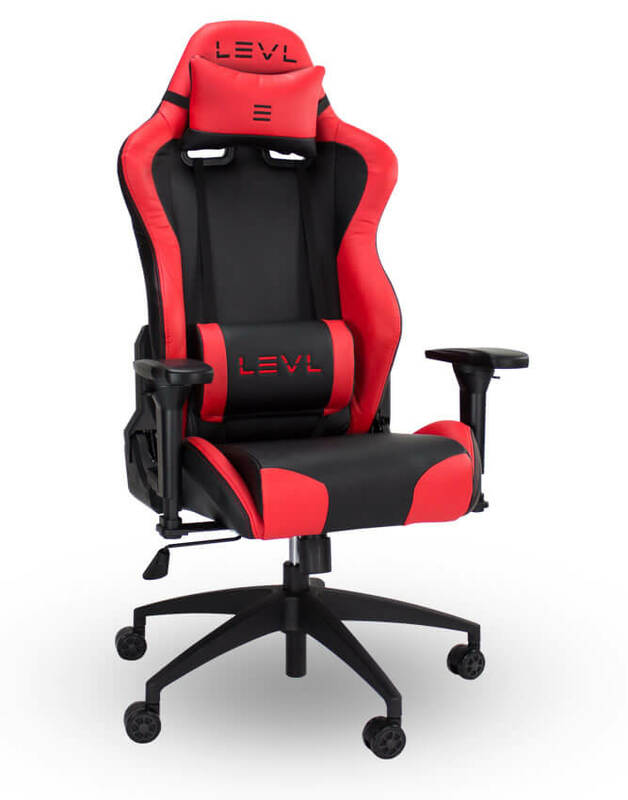 The Levl gaming chair is certainly comfortable and sturdy. I found myself in a good upright position with it and preferred using the lumbar pads to removing them. I suffer from a bad back so I tend to judge a chair by how my back feels in a week and I have had no back issues so far. Again, it doesn’t outdo Dxracer in comfort but it is just as comfortable. I did like the reclining feature and it works perfectly well as a gaming or office chair. I work from home and as such am always looking for a good multi-purpose chair and this is good for that. It also passed my two daughters jump all over it and maul it, pull every button and lever and swing around in it for 20 minutes test. A test I come to rely on in my house. The foam is a bit on the softer side compared to many gaming chairs. That isn’t to say that you will sink into the chair, just that it isn’t quite as hard. For larger folks, this will prevent a lot of sore legs since the seat won’t feel quite so hard and end up cutting off circulation in the legs. Since the back offers some softness, the seat will conform to the contours of your back, adding even more ergonomics and ease back pain. The type of foam used in the Levl gaming chair stays cool, even if your room is a bit hot. It has a way of deflecting your body heat and pulling it away for you, keeping you cool. ​​I’ve had chairs, office, and gaming, that have done a number on my floor. The soft caster wheels come highly appreciated as they are safe on just about any surface. Sure, you can use a mat on your hardwood floor to protect it, but I find that sometimes those mats can be on the soft side and the chair just doesn’t glide on them. Hydraulics are important for the durability of a gaming chair. That’s why I appreciate when they are made with 4 case cylinders instead of a typical compressed air system. And not just for the larger guys. Eventually, an inferior hydraulic system will fail, but the gas cylinder of the Levl Alpha Series M gives peace of mind that it will last a long time. The gas piston is rated at grade-3 and can safely support up to 400Kgs over an extended period of time. This chair isn’t made for particularly large folks, but the extra safety measure can always be appreciated for what it is. The base frame and the tilt hinges are built to withstand high levels of stress, with the five-star leg system carefully balancing your center of gravity towards the sturdier parts of the chair. One thing to note about the Levl Alpha is that the base and the legs themselves aren’t made entirely out of stainless steel. While there is a steel framed laced within, the legs may give out and warp or be disfigured by excessive stress being placed upon them. This is a personal preference, but I prefer armrests that can be removed or lifted up out of the way. While I appreciate the fact that they are adjustable, I wish there are times when I am doing something and they simply get in the way. 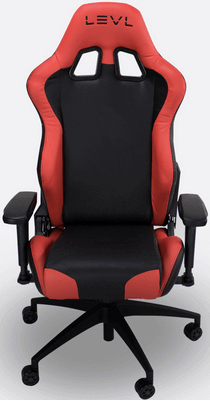 Another small gripe is that the Levl gaming chair doesn’t lean back as much as I would like sometimes. This is a small nitpick as it isn’t often that I want to lean back pretty far. When I need to rest my eyes for a few minutes during a particularly long marathon gaming session, I like to lean way back and take a breather. The Levl Alpha Gaming Chair does adjust, I just wish it was more. 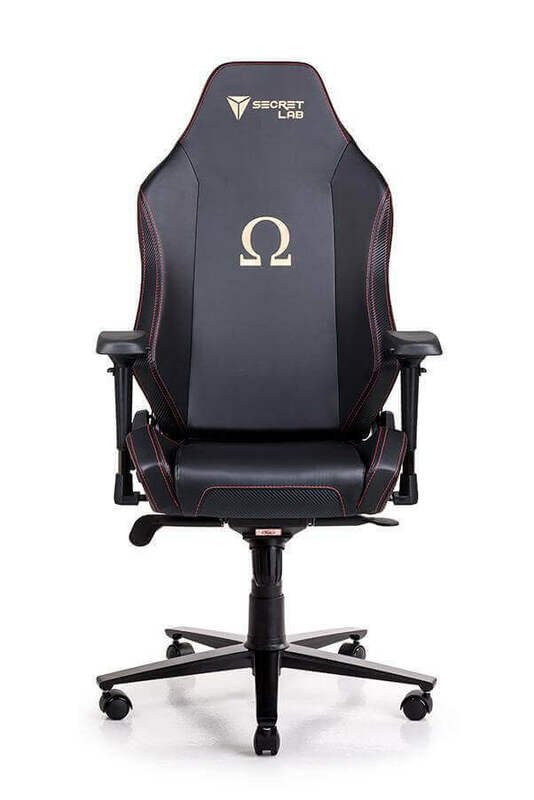 I think the Levl Alpha Gaming Chair is good value, with the guarantees and returns part I think it becomes an excellent value. Many chairs offer similar comfort and quality components are as you would expect from a high-end gaming chair company, this is no different, the product looks and feels sturdy and it does look good. The price point of $299 makes it a mid-range gaming chair and is very reasonable at that price. Now why I would recommend buying this chair is the hassle-free returns and guarantee. Levl has placed a bet with you that you will like their chair and have backed it up with their guarantee. I have yet to find another chair that you can send back free of charge and get your money back for. Most would have you believe that is the case but really it is not. Where other chairs give you 30 days trial, Levl gives 60. Where others give 2 years on all components, Levl gives 3. Now all other things above in comfort, style, ergonomics, durability, and price being equal with other brands – this cast iron guarantee should be the difference when making your choice. I assure you that this chair is every bit as good as the DXRACER RACING SERIES RW106 or the AKRACING AK7018. They even do a full comparison chart of components here and they do stand up to scrutiny. What I also assure you is that if you don’t like it, you will not have any issues sending it back for your money back or a replacement. Entering the market with a big unique selling point being ease of return and warranty is a risk I think really paid off with what is a very solid and value for money chair. Without knowing how tall you are your review isn’t nearly as useful. I need to know if the chair will work well for people 6′ 2″ to 6′ 3″ in height. A lot of people are probably looking for the same info. Very few chairs work for tall people.